Farmers of the state are enthusiastic to derive benefit from the Jai Kisan Crop Loan Waiver Scheme. 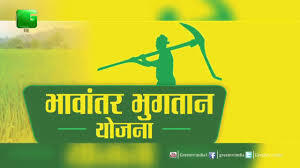 More than 12 lakh 85 thousand farmers have submitted their loan waiver applications in gram panchayats on January 15 and 19 in the first five days of the scheme. Nearly 5 lakh 38 thousand 283 applications have been submitted today itself. The application forms submitted by the farmers include 60 percent green, 38 percent white and 2 percent pink. So far 7 lakh 48 thousand 868 green, 4 lakh 89 thousand 509 white and 46 thousand 624 pink applications have been submitted. It may be mentioned that applications for loan waiver will be received from the farmers till February 5, 2019 under the prescribed implementation procedure. According to the estimation of the Farmers Welfare and Agriculture Development Department, total 54 lakh loan waiver forms are expected to be submitted till February 5. Chief Minister Shri Shivraj Singh Chouhan has said that the purchase of gram, red lentils and mustard on Minimum Support Price. It will continue if need arises. He issued instructions that all essential arrangements have been made for farmers in the Mandi. He instructed to extend the last date of wheat procurement also as per need. Shri Chouhan was reviewing procurement on Minimum Support Price at the Mantralaya today. CM Shri Chouhan said that arrangements should be made with the participation of farmers in the Mandi. Behave cordially towards farmers. Arrangements in Mandi should be pro-farmers. There should be better arrangements of tea and snacks, buttermilk and shade. Waiting time should be reduced. Number of weighing scales be increased and premises should be extended. He assured farmers about 100 percent crop purchase. Shri Chouhan instructed to make the system of issuing SMS and token more effective. Shri Chouhan told the officials to keep constant vigilance over the purchase work. Primary information of the problem should be obtained at local level promptly and should be monitored. Problems should be resolved promptly. He reviewed arrangements of jute bags, transport, storage and payment. Shri Chouhan obtained information of the progress in the work of depositing the amount given for garlic to farmers accounts. Chief Secretary Shri B.P. Singh, Director General of Police Shri R.K. Shukla, Principal Secretaries, divisional commissioners of concerned departments and Inspector General of Police were present on the occasion. 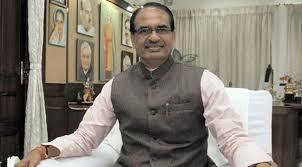 Chief Minister Shri Shivraj Singh Chouhan has said that Bhavantar Bhugtan Yojana will be made better. Manual Survey System of crop registration under Bhavantar will be changed. Efforts are being made to conduct survey work through satellite to avoid human errors. He said that farmers are being encouraged to store crops so that they are able to sell their crops at a fair price in the market. On storage of crops, the farmers will get immediate payment of 25 percent of crop value by the bank. The interest however will be paid by the government. The scheme has become popular among farmers. Farmers are demanding inclusion of other crops also. The CM was replying to queries during Shikhar Sammelan held by a news channel. CM Shri Chouhan told that public supports people who work. The government has attempted to realize inclusive development in state. Several social security schemes including Re one per kg wheat, fee payment of higher education of outstanding students, free medical treatment, land to landless etc. have been implemented after dialogue with the public. Government efforts have led to bumper production in agriculture sector. The new challenge is to fetch fair price to farmers for hard work. Efforts are being made in the direction of agricultural product value promotion. An additional Rs 265 besides Rs 1735 support price per quintal wheat will be given to farmers due to drought situation. He said that apart from stern action on corruption, arrangement of laws for delivery of public service, confiscation of property, e-tendering, e-measurement an e-payment has been made to improve the system. There will be only one cadre of teachers. About 2 lakh teachers have been appointed in the last few years. Very soon recruitments will be made for 40 thousand teachers posts. At least 50 small and big irrigation projects are in progress in Bundelkhand. Efforts were made to fill Chandel era ponds. Dam is being planned on Kane-Betwa. Government has increased irrigated area from 7.5 lakh to 40 lakh hectare which has been done before time. Plan is to further increase it to 80 lakh hectare. He told that a bill will be brought soon to regulate fees in private schools. Youth Empowerment Mission has been made to provide new opportunities to youths. Efforts will be made to upgrade skills of 7.5 lakh youths and provide self-employment to 7.5 lakh youths. All houses in rural areas will have own toilets by October 2, 2019. 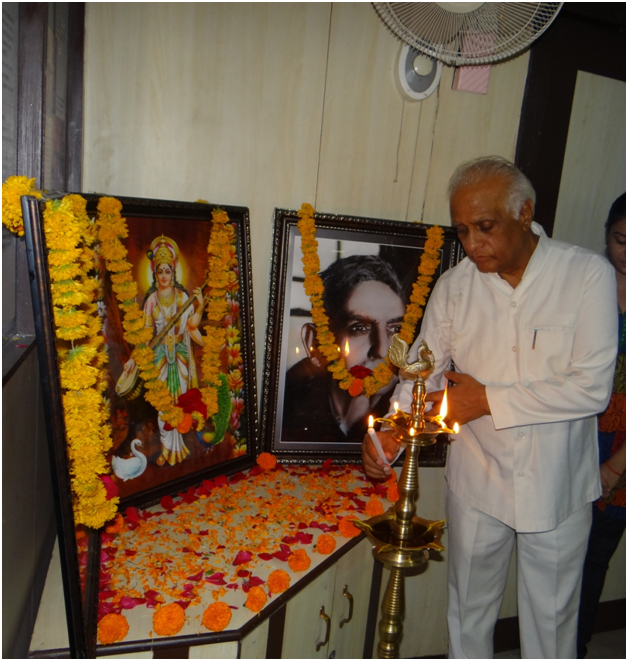 Medical college has been opened in Sagar for better health services. This year seven new medical colleges will be opened. Treatment scheme up to Rs 5 lakhs will be effectively implemented in state. During a discussion, the Chief Minister informed that the bill related to death penalty to rapists of minors has been sent for approval to the President. On law and order system he said that no big listed dacoit gang exists in state, SIMI network has been busted. Naxalism has ended in borders of Balaghat. He told that Rs 2 lakh crore investment has been made during two global investor summit 2014-2016 in state. He gave details of states progress while telling about the situation of the state about a decade and a half ago. He said the state has surplus power. Rs 85 thousand crore will be spent on urban development. The state tops in Pradhan Mantri Gramin Sadak and Awas Yojana. Drinking water supply and power supply has been improved. 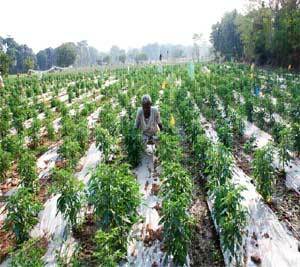 Organic farming is being promoted by the Farmer Welfare and Agriculture Development Department in Madhya Pradesh. Agriculture cost of farmers who have adopted organic farming has reduced and they are also availing other benefits including fuel. Panna Farmer Ramkishore Nagaich of Pawai village in Panna district has established a gobar gas plant with the help of the Farmer Welfare Department from which he has received several benefits. Ramkishore Earlier would always use chemical fertiliser in his field. Because of this the fertility of his agricultural land was reducing thus affecting agricultural production. He also discussed about it to the field officials of Agriculture Department. They advised him to use gobar gas plant in his house. He had 6 milching cattle and he started using their cow dung in the plant. He also started using the cow dung to make organic fertiliser. Today his agricultural cost has come down to a great extent. There is improvement in soil health also. Now Ramkishore is no longer dependent on the market for fertiliser and fuel. Mandsaur Farmer Kamlesh who hails from village Berkhedadev of Mandsaur district has been farming with chemical fertiliser since all these years. With the fertility of the soil waning, agricultural production was also coming down. He spoke about this with the field officials of the Farmer Welfare and Agriculture Development Department. Kamlesh was then given information about the process of making organic fertiliser. He was also told about organic tonic, organic kaadha to keep away pests. He was also told about use of gaumutra for Jeevamrit, Beejamrit, Jaivik Kaadha made out of vanaspatik leaves, jaivik tonic made from cow dung cakes and vermiwash. Says Kamlesh that by adopting organic farming, soyabean production has increased from 20 quintal to 25-30 quintal per hectare. Besides, wheat production which was 55 quintal per hectare, has now increased to 70 quintal per hectare. Organic farming is now fetching Kamlesh an additional income of nearly Rs 40 thousand in a year. Farmers are being encouraged in Madhya Pradesh to grow horticulture crops along with the traditional crops. Shri Hukum Singh, the farmer of village Bhagwatpura of Makdon Tappe of Ujjain district has earned handsome profit by growing horticulture crop on his farm. Hukum Singh holds 200 bigha land. He used to grow traditional crops like soybean, wheat and gram on his agriculture land. 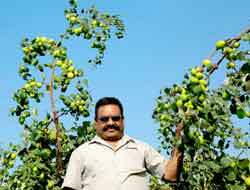 Hukum Singh had grown variety of apple ber on his two and half bigha land besides traditional crops last year. This variety of ber of Thailand has a shape and taste like apple. He decided to sell ber of unique taste in packaging under the brand name this time. His brand received a good response in Indore and Bhopal as well. 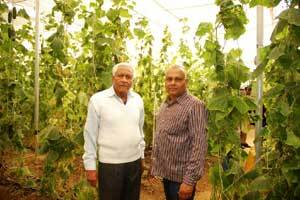 His brand Patel Krishi Farm has also established its image in the surrounding mandis of Ujjain due to the good taste. Situation has become such that whenever ber load reaches mandis, its get sold immediately. Hukum Singh says that this variety of ber is being purchased in the market at the rate of Rs. 35 to 40 per k.g. He has used bare minimum chemical fertliser in the ber crop. Conducting new experiments, he has also grown kaghzi lemon on 7 bigha and custard apple on 5 bigha land. He says that the officers of the Horticulture department have given him the technical guidance to grow fruits, which has become fruitful to increase the income. Chief Minister Shri Shivraj Singh Chouhan has appealed to the hailstorm affected farmers that they should not worry at all in this hour of crisis. Full compensation will be provided against the crop loss. In his appeal to the farmers, he said that crop loss effects life and it also affects childrens future, but there is no need for the farmers to be worried and feel sad. Relief amount including crop insurance amount will fully compensate the crop loss. The government is with farmers every moment in this hour of crisis. Farmers will not face any kind of problem and there is no need for them to be worried. Moreover, Shri Chouhan mentioned that damage caused to the crop by hailstorm will be fully assessed with transparency. Survey teams will be formed to ascertain the loss and activity to paste assessment of loss in panchayats will be started soon. In case of objection raised on the assessment by any person then it will be rectified immediately. The entire government is with farmers. We will not let farmers bear the loss. 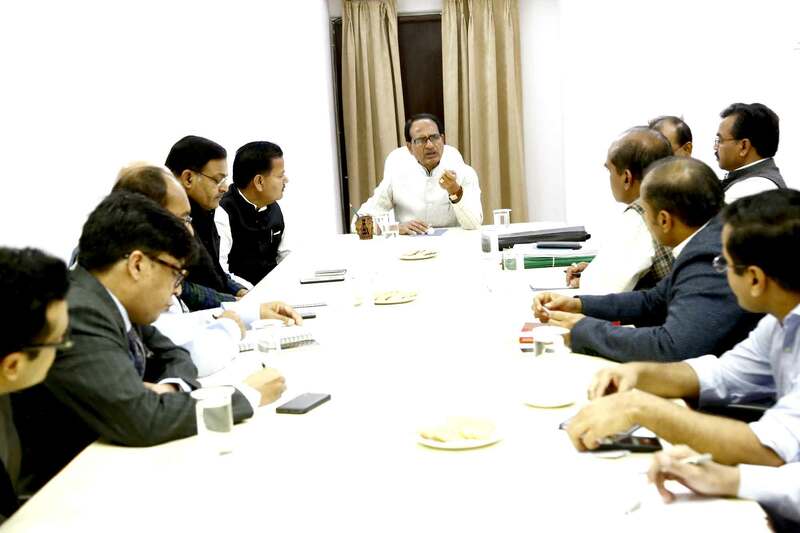 Earlier to this, CM Shri Chouhan gathered information about the crop loss in the hailstorm affected areas by convening a high level meeting at CM House. According to the initial information, the hailstorm has caused damage to the crop of 621 villages of 13 districts. The maximum damage to the crop has been caused in Bhopal, Vidisha, Sehore district of Bhopal division. Moreover, there is an information of substantial damage to the crop in Seoni, Chhindwara, Balaghat, Dewas and Hoshangabad. About 27 thousand hectare area has been affected by the hailstorm. The Chief Minister Shri Chouhan has given instructions to begin the survey work immediately to assess the loss by forming teams of patwaris, gram sevaks, agriculture field staff and public representatives. Chief Secretary Shri B.P. Singh, Additional Chief Secretary Finance Shri A. P. Shrivastava, Agriculture Production Commissioner Shri P.C. Meena, Principal Secretary Agriculture Shri Rajesh Rajoura, Principal Secretary Revenue Shri Arun Pandey, Principal Secretaries to CM Shri Ashok Varnval and Shri S.K. Mishra besides other Senior Officers were present in the meeting. Public Relations, Water Resources and Parliamentary Affairs Minister Dr. Narottam Mishra said that making irrigation facility available to farmers is topmost priority. He said that the government is not doing any favour on the farmers instead it is fulfilling its responsibility. Dr. Mishra was addressing farmers of Bhagour village in Datia district. PR Minister Dr. Mishra said that there are 926 farmers in Bhagour who will receive Rs 59 lakh 98 thousand 246 as drought relief amount. He told that relief amount is being given to only 517 farmers who have submitted their documents. He urged the remaining farmers to submit their papers to the patwari or tehsildar so that they too can get their relief amount soon. He said that a major area of Bhagour has already received irrigation facility. The remaining rakba will also be provided irrigation facility through Khairi canal as soon it begins. He said that there was maximum water scarcity in 35 villages. This problem has been solved through surface tap water scheme. Giving information about the Pradhan Mantri Sahaj BIjli Har Ghar Yojana, the PR Minister told that free power connections will be provided to all. PR Minister told farmers that they should get registered under Bhavantar Bhugtan Yojana without fail so that they get fair price for gram, masoor, mustard, onion etc. He urged them to get registered under insurance scheme also. Several peoples representatives and villagers were also present during the programme. Farmers Getting Meals on Concessional Rate in 257 Krishi Upaj Mandis. Several kind of facilities are being provided by the Madhya Pradesh State Agriculture Marketing Board to the farmers arriving in the krsihi upaj mandis to sell their crops . The Farmers Welfare and Agriculture Development Department has implemented a scheme to provide meals to the farmers on concessional rates, to enable them to get good food with convenience in the premises of mandis itself. Meal at the rate of Rs. 5 is being provided to the farmers in 257 krishi upaj mandis of the state. The Mandi Board has provided an amount of over Rs. One crore in the form of grant to the krishi upaj mandis for this activity. Meals arrangement on the concessional rate have been made by A and B category mandi committees by their own resources, whereas the grant is being given by the state government for meals arrangement in C and D categories mandis. Agriculture Marketing Award Scheme Agriculture Marketing Award scheme is being implemented by the Agriculture Marketing Board to ensure that farmers must come to sell their agriculture produces in the mandis only. Under the scheme, draws are held twice a year on the occasion of Narmada Jayanti and Balram Jayanti in krishi upaj mandis. Thirty five h.p. tractor is given to the farmer for bumper draw in A category mandis, whereas agriculture equipments up to Rs. 50 thousand cost is given in B, C and D category mandis as per the draw. Beside this, cash rewards are also being given to the farmers in mandis. Awards worth Rs. One crore 50 lakh were given to 880 farmers during the last 2 years to encourage them. The Madhya Pradesh State Agriculture Marketing Board is a three tier level organization in the state with its head office at Bhopal. The Board has 7 regional offices situated in Bhopal, Indore, Ujjain, Gwalior, Sagar, Jabalpur and Rewa. Two hundred 57 mandis and 287 up-mandis are functional in the state. There are 1321 haat-bazaars in the state. Rs 1450 crore Bhavantar amount to be paid to 10.58 lakh farmers. 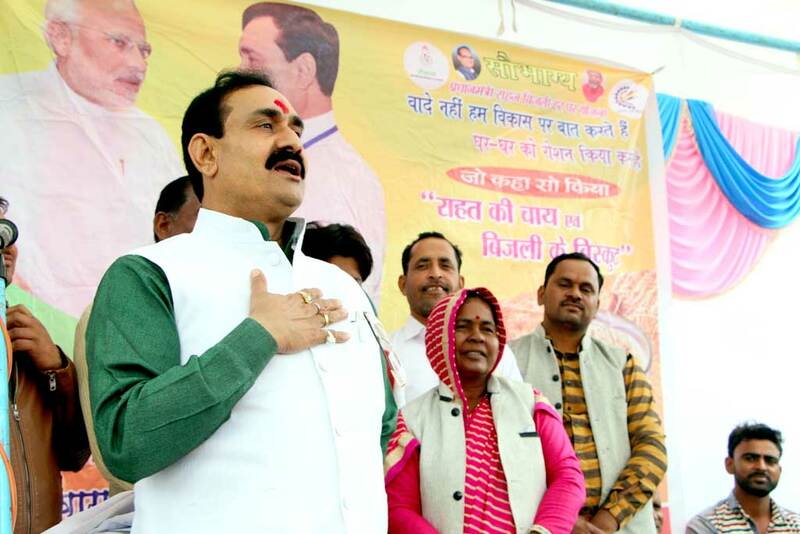 PR Minister explains Bhavantar Bhugtan Yojana to farmers in villages of Datia like a teacher. Public Relations, Water Resources and Parliamentary Affairs Minister Dr Narottam Mishra is explaining Bhavantar Bhugtan Yojana to farmers, just like a teacher. Dr Mishra today, reaching to different villages of Datia district, told the farmers about different schemes including Bhavantar Bhugtan Yojana, while interacting with common men specially farmers. The Public Relations Minister, before this, had informed farmers about beneficial provisions of Bhavantar Bhugtan Yojana in many villages. The Public Relations Minister reached village Bargany, Jigna and Sonagiri in Datia district and gave information about number of benefitted farmers and amount given under Bhavantar Bhugtan Yojana. He informed that new registration for Rabi season will start from February 12.For drought relief amount, Aadhar number and mobile number etc. should be given to Patwari or Tehsildar by farmers. He informed benefitted persons in Sinaval, Sevani, Morera villages. 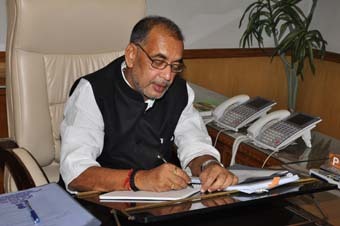 The Public Relations Minister appealed to farmers to get benefit from this important scheme. He told the farmers that Rs 4400 for gram and Rs 800 per quintal for onion will be paid to farmers under the scheme. Public Relations Minister Dr Mishra also informed about Saubhagya Yojana. He told the villagers that free electricity connection is being provided to every person under the scheme. The state government is committed to provide benefit under the scheme to every door easily. Public Relations minister was welcomed in all villages. Public Relations minister visited village Dang Karera also. System to give one and half time of cost to farmers under consideration: Minister Dr. Mishra. 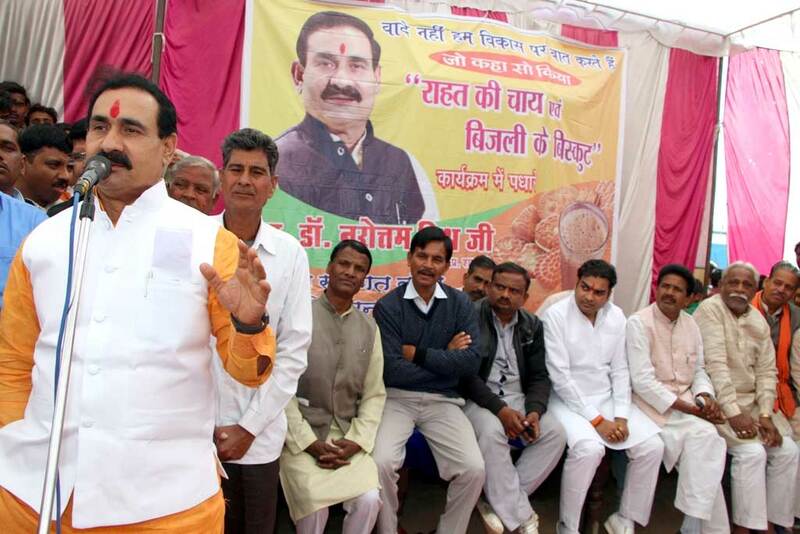 Public Relations, Water Resources and Parliamentary Affairs Minister Dr Narottam Mishra gave information about the free electricity connections to farmers under Saubhagya Yojana while visiting various villages of Datia. Dr. Mishra first reached Bahadurpur village. He said that the Central Government is planning to implement a system soon, so that farmers can get one and a half time of cost of their crops. If famers get lesser value for their crops, amount will be given on the line of Bhavantar Bhugtan Yojana. Public Relations Minister informed that Rs 42 lakh 10 thousand 52 and Rs 15 lakh 72 thousand will be given to 536 farmers in Bahadurpur and 292 farmers in Maharajpur respectively. Public Relations Minister reached Niraval and Makauni Public Relations Minister informed villagers about the government schemes in village Niraval. He informed that 479 farmers will get Rs Rs.19 lakh 20 thousand in Niraval; 318 farmers will get Rs 19 lakh 56 thousand in Bidniya, 344 farmers will receive Rs 15 lakh 30 thousand in Bhavanipur and 424 farmers will receive Rs 20 lakh 24 thousand and 145 farmers of Khairi will get Rs 14 lakh 34 thousand amount. Dr. Mishra reaches Chirula by motorcycle Dr. Narottam Mishra reached village Chirula by motorcycle to meet farmers. He addressed the farmers and said that 989 farmers will get Rs 42 lakh 68 thousand in Chirula as a relief. Rs 28 lakh 58 thousand will be given to 528 farmers in Kararikhurd and Rs six lakh 45 thousand relief will be given to 75 farmers in Vilhar village. MBA degree holder Subir Chaturvedi of Devri village of Gram Panchayat Kachgawan in Katni district is engaged in farming of horticulture crops in poly house through advanced horticulture techniques. He has worked as an advertising marketing manager in a national newspaper from year 1998 to 2006. He also worked as a senior branch manager in a private insurance company from year 2006 to 2012. Subir came to Katni and settled down for the sake of his family and adopted horticulture which was quite different from his profession. Under the guidance of Horticulture Department, Subir first produced capsicum in a poly house. Now he is producing cucumber in his poly house. Subir got a grant for poly house construction under Protected Farming Scheme of the Horticulture Department. With this grant he got the poly house constructed at a cost of Rs 17 lakh 80 thousand on half an acre area. In this Rs 8 lakh 90 thousand grant amount was given to Subir by the Hortriculture department. Subir did come across certain technical problems at first during capsicum production in the beginning but it got solved. Through this he earned an income of Rs 4 lakh through capsicum production within 7 months. Later Subir cultivated Italian cucumber in his poly house through he generated an income of Rs 2 to 3 lakhs in just 2 to 3 months. Subir is still cultivating cucumber in his poly house. 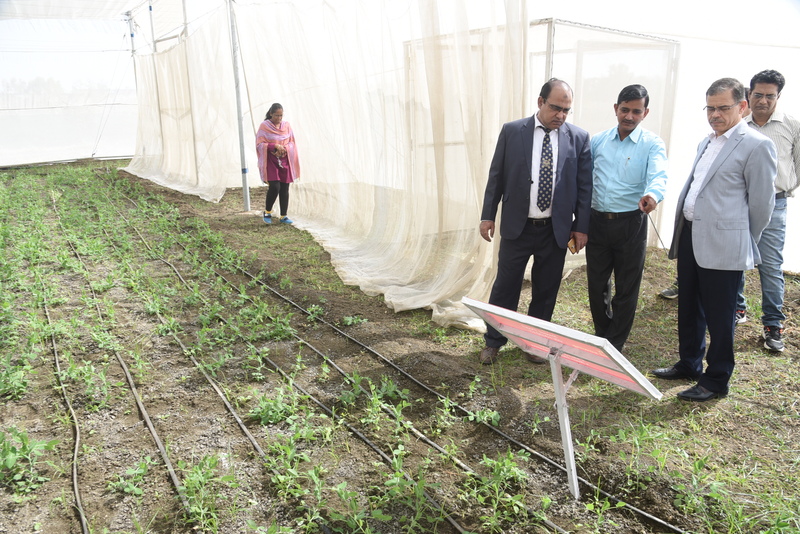 Subir Chaturvedi is now included in the progressive farmers� list and is preparing to produce other advanced horticulture crops. Union Budget is Pro Poor and Farmers: CM Shri Chouhan. Chief Minister Shri Shivraj Singh Chouhan said that the Union Budget tabled in the Parliament is a pro poor and farmers� budget. This budget will provide relief to the common men of the country. CM Shri Chouhan was giving his reaction on the budget at Mantralaya here today. CM Shri Chouhan mentioned that this budget will realize the dream of the Prime Minister Shri Narendra Modi for building New India. This revolutionary budget will help in eradicating poverty and for creating employment opportunities. Remarkable steps have been taken in the budget for the farmers and poor. It has solutions to double the farmers� income and will strengthen rural economy. Shri Chouhan stated that the strict steps taken by the Prime Minister in the economy sector has started yielding good results. This budget will facilitate more speed to the fast growing Indian economy. Shri Chouhan mentioned that the budget is focused on poor welfare agenda in the budget. The budget mentions, construction of one crore houses in one year for the poor in the rural areas. A revolutionary decision has been taken for the health sector. Under this, medical treatment expenses of up to Rs. 5 lakh for 10 crore poor families will be borne by the government. Announcement has been made for one medical college in each 3 parliamentary constituency. Also, a revolutionary initiative has been taken in the education sector. Eight crore poor women will get rid of smoke through Ujjawala Yojana. Provisions have been made for agriculture sector in the budget to fix support prices of kharif and rabi crops by adding 50 percent profit in the input cost and arrangement of 10 lakh crore loan. Rural areas will experience major transformation owing to the provision of Rs. 14 lakh crore made for rural infrastructure in the budget. Employment opportunities will increase due to the investment in the infrastructure development in rural areas. Stressing on micro irrigation, provision has been made to form micro irrigation fund. Baans Mission will also facilitate more employment opportunities. Free electricity will be supplied to the houses of 4 crore poor under the Soubhagya Yojana. An increase of 20 percent has been made in the budget for scheduled caste and tribe. This is important for the upliftment of weaker section. A sum of Rs. 148 lakh crore will be spent for the expansion of railways. Two lakh 50 thousand villages will be linked with broad band. Ten main places will be developed in the form of tourist places. Provision of Rs. 3 thousand 794 crore has been made for MSME�s loan, which will help increase in employment opportunities. The revolutionary initiative to eradicate poverty and to increase employment opportunities has been taken in the budget. To ensure that farmers of the state get the right price for their produce, 58 krishi upaj mandis have been connected with �e-NAM� trading portal. Farmers can sell their agricultural produce through this system. While on the one hand the information concerned with the trader who makes the bid is kept secret, the farmer also gets the benefit of the competition among the traders on the other hand. Another benefit is that traders of other Mandi areas and out of the Mandi area can directly make the bid of gins on the e-NAM portal. This enables farmers to get benefits of local market besides outside markets. National Agriculture Market (e-NAM) is a PAN India electronic trading portal which is a good medium of current Krishi Upaj Mandi Samiti for construction of an integrated national market for agriculture related produce. e-NAM portal is capable of providing single window services for information and services related to all krishi upaj mandi samitis. Inflow and prices of agriculture produce in Mandi premises, purchase and sale of trade proposals, provisions of responses to trade proposals have also been included along with other services under this scheme. e-NAM portal was started by Prime Minister Shri Narendra Modi in April-2016. It was started with pilot project in Pandit Lakshminarayan Sharma Krishi Upaj Mandi Samiti Karond, Bhopal in Madhya Pradesh. By connecting to National Agriculture Market, any krishi upaj mandi can participate in the National Business Network. When the farmers bring their produce to the mandi for sale at local level, they have the alternative to sell their produce to traders from other states also through internet along with local traders. Work is in progress to connect e-NAM portal with weights and measures. One thing special about the portal is that the payment of produce sold by the farmers is deposited in their accounts the same day. As many as 15 krishi mandis of Bhopal division, 9 mandis of Indore division,12 of Ujjain division, 6 of Gwalior division, 5 of Sagar division, 9 of Jabalpur division and 2 mandis of Rewa division have been connected to the National Agriculture Market. he fame of Bhavantar Bhugtan Yojana launched by the State Government to provide reasonable prices to the farmers for their agriculture produces has started reaching outside the state now. 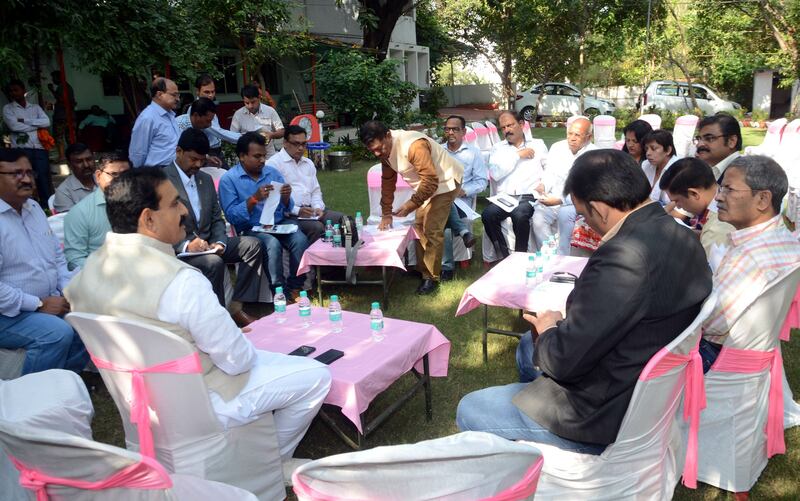 Officers of Telangana State reached Bhopal on Tuesday to gather information about the Bhavantar Bhugtan Yojana. The team of Telangana�s Officers will study the Bhavantar Bhugtan Yojana, arrangements of marketing besides other schemes related to minimum support price till January 12. 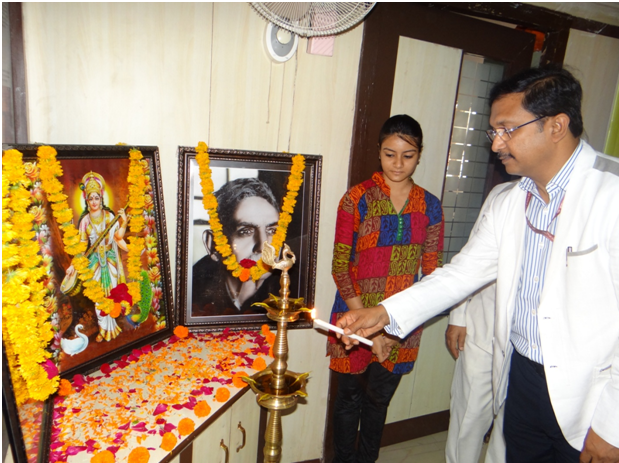 The members of the team included Shri P. Ravi Kumar-J.D.S. Hyderabad, Shri E. Mallesham - D.D.M. Hyderabad and Officer Shri Ajmira Raju- Selection Grade Secretary A.M.C. 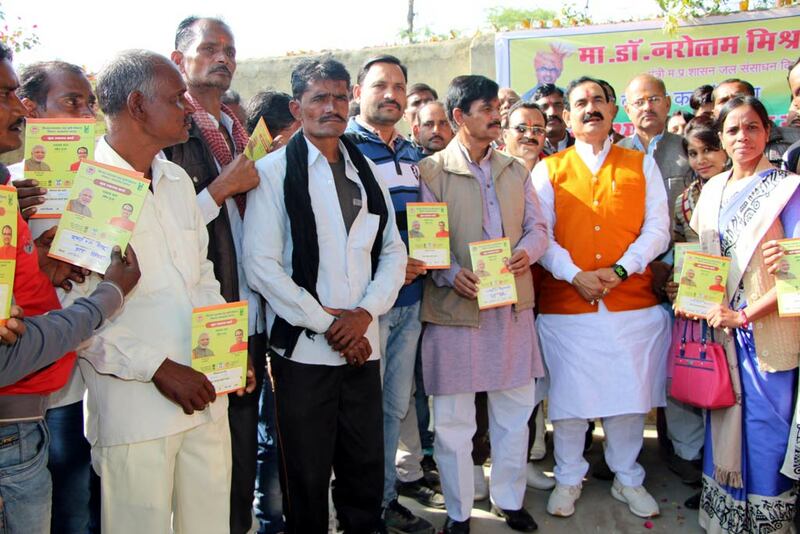 Public Relations, Water Resources and Parliamentary Affairs Minister Dr. Narottam Mishra today distributed soil health cards to farmers in Datia. Dr. Mishra told farmers to avail benefits of the state government schemes to increase their income. These schemes have become a strong medium of improving economic situation. He said that the health examination of soil will ensure advanced farming and increased production. Dr. Narottam Mishra took part in the conclusion programme of National Service Scheme camp of Government Higher Secondary School at Badouni in Datia district. He said that qualities of leadership, cooperativeness and community labour are developed in students through NSS which improves the personality of students. PR Minister Dr. Mishra inaugurated multi-gym at Badouni. He appreciated the efforts made to start the gym. Public representatives were present during the programme. Dr. Mishra presented assistance of Rs 4 lakh to a family affected by snakebite. Recently Mithilesh Kushwaha of Bahadurpur village died of snakebite. Athhilal Kushwaha, a resident of Majhgavan in Katni district is still growing vegetables on his land at 80 years of age. For this he is taking all benefits of government schemes. He is earning Rs 4 lakh yearly through vegetable production thhilal is currently growing lay finger, peas, chilly, cabbage and capsicum. He has constructed a shade net house under Protected Farming Scheme on one acre in his field. For this he received a grant amount of Rs 14 lakh 20 thousand from the Horticulture Department. Along with shade net house, they are also making use of mulching and drip irrigation for improved production. He is receiving 100 times more benefit from using mulching and drip irrigation. Drip irrigation saves water and mulching also helps in controlling weeds. Now work of four hours can be finished in one hour. A batter is made through drip and pesticides are easily sprayed on plants thus saving labour. 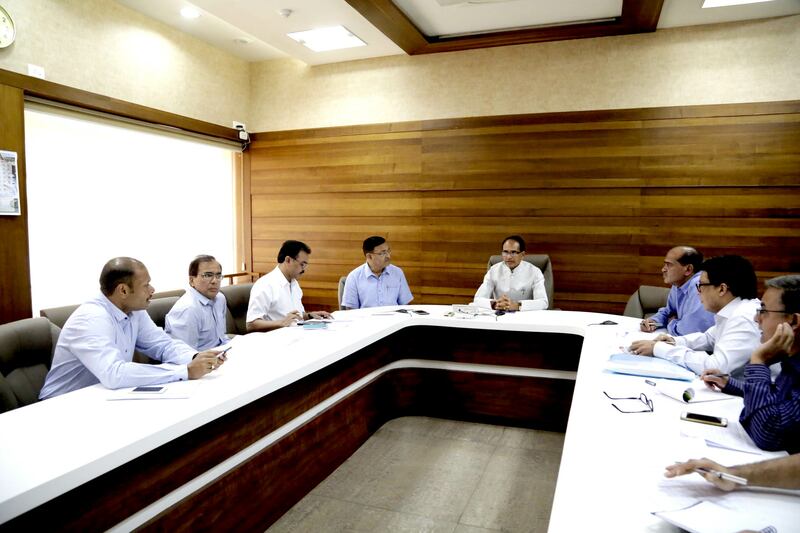 Chief Minister Shri Shivraj Singh Chouhan apprised himself about the execution of Bhavantar Bhugtan Yojana through video conference with divisional commissioners and collectors today at Mantralaya. Collectors said that confusions prevailed earlier about Bhavantar Bhugtan Yojana are minimized now. Consequently, arrival of crops has increased. Farmers are satisfied on getting good value of crops. Crops are hitting 20 weekly markets in remote areas of tribal districts. These weekly markets have been included due to arrival of the crops. Apart from this, 51 up-mandis too have been activated where farmers are coming with considerable quantity. So far, 171 lakh metric tonne grains have reached mandis. Mandis have generated revenue of Rs 28 crore in last one month alone. The Chief Minister appreciated all the collectors for making the scheme successful by working proactively in the interest of the farmers. He said that this is the time to extend support to farmers. They are in crisis. Bhavantar Bhugtan Yojana is a mean to serve the farmers. 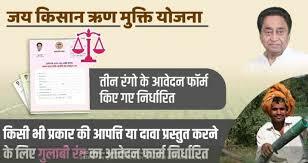 This will help in giving historic justice to farmers. He issued instructions to make monitoring teams more active and vigilant for giving right value to farmers. He said that those who created negative perception regarding the scheme, should not be given the same opportunity again. Chief Minister Shri Chouhan asked collectors to send message through SMS about the payment being made under the scheme to 1.55 lakh registered farmers selling their crops between October 16 and 31 in mandis byNovember 20. The Chief Minister instructed district and divisional level monitoring teams to visits mandis. Shri Chouhan said that payment of price difference to farmers who sold their crop between October 16 and 31 should be ensured. He said that full transparency must be maintained in payment process. Farmers should be served by extending support and no opportunity should be given to anti-farmer people to defame this farmer-friendly scheme. Shri Chouhan instructed to carry out verification of all farmers' bank accounts. He said that sowing area, production etc. should also be verified cautiously apart from bank accounts. He instructed to collect detail of bank accounts of registered farmers and avail them to mandis and deposit the money in farmers account. He said that farmers will get opportunity to put their any type grievance. The Chief Minister said that amount of price difference of the 15 days will be deposited in farmers' account on Farmers' Convention to be held in Ujjain on November 20. He said that farmers' trust in Bhavantar Bhugtan Yojana is increasing. All confusions have gone. He said that some so-called anti-farmer people had tried to spread misleading information about the scheme, they did not succeed. 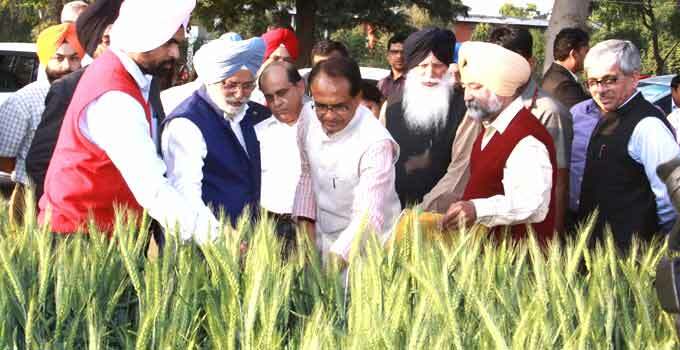 Shri Chouhan said that farmers should know how much value they have got for their crop. Each farmer should get benefit of this scheme. If real farmers have missed registration under the scheme due to some reason, collect their detail and register them after verification. Registration facility will be opened for such farmers between November 15 and 22. He instructed collectors of cotton producing districts to make special arrangements for cotton procurement and monitor it. It was informed that 15500 quintals have been procured at minimum support price at 8 centers in the state. The Chief Minister asked the collectors to encourage farmers to take benefit of storage grant scheme as well. In the Scheme, the amount of grant has been increased from Rs seven to Rs 9.90 per quintal per month. He said that offline applications will be registered online soon. Collectors appreciated The Chief Minister appreciated the efforts made by collectors of Shahdol, Jhabua and Alirajpur districts to bring the produce of tribal farmers to mandis. Special vehicles were arranged for collection of tribal farmers' produce in these districts. Total 2000 quintal grains reached Mandis in Shahdol district. Nodal officer was appointed for each village so that every farmer can be given benefit of Bhavantar Bhugtan Yojana. The Chief Minister said that the implementation of Bhavantar Bhugtan Yojana has been taken in mission mode. He instructed to continue such efforts in the future as well for this historical decision for farmers. Take action against those who are spreading misleading information about tribal's land Discussing other issues with divisional commissioners and collectors, Chief Minister Shri Shivraj Singh Chouhan said that some anti-social persons and groups are spreading misleading information that the government is making legal provision to sell their land to non-tribal people. Shri Chouhan asked divisional commissioners and collectors that keep an eye on such persons and take strict action against them for spreading misinformation. The Chief Minister clarified that the government is not making any such legal provision nor has any intention to do so. He said that people of tribal community were the owners of their land and will always be the same. He said that such anti-social elements are spreading misinformation in tribal dominated districts and they should not be paid attention. He asked collectors that tribal community people should be made vigilant and they should be alerted for not being misled by such people. 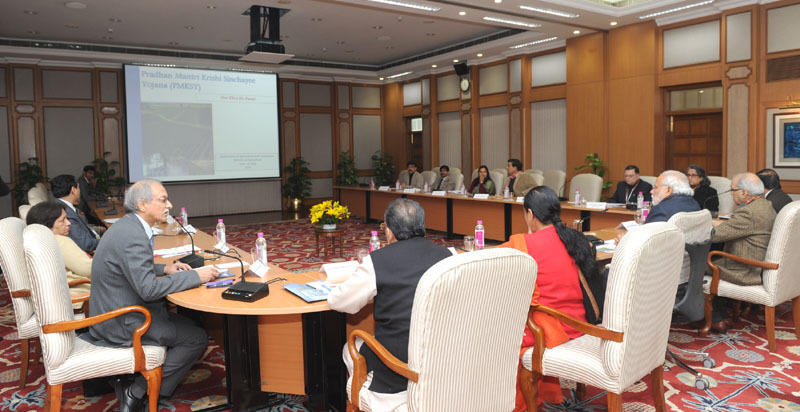 Chief Secretary Shri BP Singh and other senior officials were present in the video conferencing. An International Training of African-Asian Rural Development Organization (AARDO) on Agricultural Engineering Technologies for Enhancing Productivity and Profitability in Agriculture Sector commenced on 24 October, 2017 at ICAR-Central Institute of Agricultural Engineering (CIAE), Bhopal. The training sponsored by AARDO and Ministry of Rural Development, GOI was attended by eight participants; one each from Bangladesh, Egypt, Lebanon, Malaysia, Palestine, Sri Lanka, Sudan and Zambia. During this 14 days (Oct. 24 to Nov. 6, 2017) training programme, knowledge about technologies and equipment for agricultural production, irrigation and drainage, processing and value addition and renewable energy was imparted through lectures, presentations, practical sessions, hand-on experience and field visits. Valedictory function of the training was held on Nov. 6, 2017. Secretary General of African- Asian Rural Development Organization (AARDO) His Excellency Eng. Wassfi Hassan El Sreihin. Dr. KK Singh, Director, ICAR-Central Institute of Agricultural Engineering presided over the function. The Secretary General of AARDO informed that AARDO was formed in 1962 in recognition of need for cooperation among countries in the field of agriculture and rural development. He also told that AARDO is an autonomous inter-governmental organization with 32 member countries. AARDO realizes its objectives, among others, by way of human resource development which is based on training programmes, workshops, seminars, study visits, deputation of experts, etc. AARDO strategies are broadly focussed on four areas, viz. human resource development, financing of development pilot projects, dissemination of information and networking. He further stated that keeping in view of the vast experience and technological know-how available in India in the field of Human Resources Development; arrangements have been made with the Government of India for the award of training fellowships to the officials from AARDO member countries. Having realized that agriculture is one of the most influential professions in rural development, AARDO has been supporting training programmes for agriculture professionals in its member countries and there is no better organization in India than Indian Council of Agricultural Research (ICAR) to host such training programmes. In the specific area of Agricultural Engineering, AARDO has been collaborating with ICAR-Central Institute of Agricultural Engineering (CIAE), Bhopal since 2010 and all its programmes have been highly effective in imparting appropriate technical know-how to the participants. In his presidential address, Dr. KK Singh, Director, ICAR-CIAE told that over more than four decades of its existence, ICAR-CIAE has developed many technologies highly relevant to marginal, small and medium scale farmers. The institute is an active collaborator to various international agencies like AARDO, UN-EPCAM, WAAP, USAID, SAARC, etc. He further added that this course aimed at enlightening the participants in the areas of: Agricultural Mechanization, Post-harvest Mechanisation, On-farm Energy Management and Agricultural Mechanization Strategies; relevant to the member countries of AARDO and informed that this is fifth time that ICAR-CIAE has organised training for participants of AARDO member countries. He informed that the discussions during the current training helped the scientist of the institute to understand geographic, social, economic and political scenario of the participating countries and hoped that this programme would prove to be stepping stone towards formation of collaborative developmental projects in future. He assured that ICAR-CIAE would extend all support in the field of agricultural engineering to the AARDO and stakeholders of its member countries. Earlier, participants shared their experiences during training and expressed that they could gather a lot of new information which would prove very important for rural development in their respective countries. They also expressed that getting to know geographical and social framework of central India and relishing local cuisine has been a memorable experience for them. On this occasion, course director of the training, Dr. Nachiket Kotwaliwale presented a detailed report on the proceeding of 14-days training and Dr. PC Bargale presented vote of thanks to the sponsors, participants, training faculty and all the dignitaries. Chief Minister Shri Shivraj Singh Chouhan said that Bhavantar Bhugtan Yojana will be continued in the interest of the farmers. He further mentioned that people of the opposition is creating confusion about this scheme. . Shri Chouhan made appeal that farmers should not come in any ones enticement. He stated that he is a son of a farmer and understand the pains and problems of the farmers. CM Shri Chouhan was addressing the inaugural function of Vikas Yatra on the occasion of Madhya Pradesh foundation Day in village Bhanpura of district Mandsaur. He dedicated unit -2 of Bhanpura Canal Project on the occasion. He also dedicated and laid foundation of development and construction works costing about Rs. 500 crore of Mandsaur district today. These projects will irrigate 37 thousand 700 hectare land of 130 villages Moreover, Shri Chouhan announced that keeping in view the scanty rainfall in the state, temporary electricity connections will be provided to the farmers for a period of 2 months. Shri Chouhan said that the government will provide pucca house to every poor person of the state during the next 3 years. He further stated that land lease (patta) will be given to every poor person for his/her present house and the government will also provide them houses. Inaugurating the Pradesh Vikas Yatra from village Bhanpura, Shri Chouhan said that our Madhya Pradesh will become an example of constant development now. Speed of development will not break in any condition. He gave credit to the hard labour of the farmers for over 20 percent growth rate of the state achieved constantly during the last 5 years. Shri Chouhan stated that Madhya Pradesh has no more a Bimaru State. Irrigation facility was provided on just 7.5 lakh hectare land of the state in the past. The irrigation area has been increased to 40 lakh hectare area with the efforts of the government. Congratulating the farmers of Garoth and Bhanpura area, Shri Chouhan said that this is happened first time that water is being supplied from Gandhi Sagar to every farm and house of Bhanpura and Garoth tahsils by laying pipeline through underground canal. He mentioned that this area now will enrich with crops. Shri Chouhan made announcement for approval of Rs. 800 crore for Shamgarh-Suwasra Irrigation Project. The project on completion will facilitate irrigation on 40 thousand hectare land of 180 villages. He further announced for survey to supply water to the village of Manasa of Neemuch district. Shri Chouhan mentioned that the approval will be given for irrigation projects as demanded by the local public representatives on the basis of survey and its report. All kind of new construction works will be carried out in Dudhakhedi Mataji Mandir. Positive steps will be taken for 100 beds hospital in Garoth. Shri Chouhan mentioned that all the obstacles related to establishment of food park in Daloda will be removed. Tolas and Majras (Settlements) of Garoth area will be made revenue villages. Electricity will be provided to all the deprived families within next 2 years. Benefit certificates of over Rs. 24 crore of various government schemes were distributed to total 17 thousand 892 beneficiaries of Garoth and Bhanpura blocks in the programme. The Chief Minister Shri Chouna also distributed benefits to 25 beneficiaries symbolically. 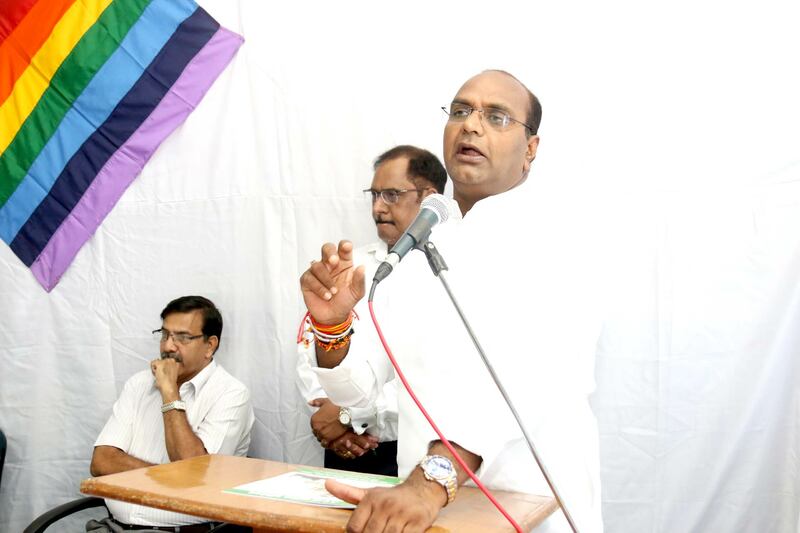 Local MP Shri Sudhir Gupta and MLA Garoth Shri Yashpal Singh also addressed the programme. MLAs Shri Jagdish Devda, Shri Omprakash Saklecha, Shri Dilip Singh Parihar, President Jila Panchayat Smt. Priyanka Dr. Mukesh Giri Goswami, Chairman Farmers Welfare Commission Shri Ishwarlal Patidar, Chairman District Cooperative Bank Shri Madanlal Rathore, Office Bearers of Panchayat Raj Institutions, Public Representatives and Citizens in large number were present in the programme. Chief Minister Shri Shivraj Singh Chouhan today reviewed the Mukhya Mantri Bhavantar Bhugtan Yojana at the Mantralaya. He issued instructions to ensure all arrangements for display of model rates of produce in the mandis and their purchase. Chief Secretary Shri B.P. Singh, Additional Chief Secretary Home Shri K.K. Singh, Commissioner Agriculture Production Shri P.C. Meena, Principal Secretaries to the CM Shri Ashok Vernwal and Shri S.K. Mishra, Mandi Commissioner Shri Faiz Ahmed Kidwai and senior officer were present. It was told that action has been taken against anti-social elements who have been disturbing the mandi atmosphere. Cash payment to farmers has begun and they are now not facing any kind of problem. The Chief Minister issued instructions to all the senior officers to visit the mandis and redress grievances of farmers immediately. During the review it was told that farmers are receiving fair price for urad and moong yield after Bhavantar Yojana. It has also been told that the Bhavantar Yojana has neither made any negative effect nor has the price of the produce reduced. Farmers are also not facing any loss. Mandi trade is being undertaken peacefully and farmers are getting their cash payment. Collectors and related administrative officers are taking care of the arrangements. Chief Minister Shri Shivraj Singh Chouhan today conducted a detailed review of the Bhavantar Bhugtan Yojana at a meeting of high level officials at his residence. He directed to ensure that the farmers must get fair price for their produce at any cost. Chief Secretary Shri B.P Singh and other senior officials were present at the meeting. Shri Chouhan said that control rooms should be set up in the districts to remove the myths being spread regarding Bhavantar Bhugtan Yojana. He told to make proper arrangement for immediate redressal of the farmers� grievances on the toll free number. He told to entrust responsibility of the districts to the senior officials so that they can go to the mandis and ensure proper implementation of the scheme and redress grievances of farmers on the spot. The Chief Minister clarified that traders will not have to face any obstruction in cash payment to farmers against their agricultural produce. He said that cash payment of Rs 50 thousand must be made to the farmers on sale of agricultural produce. The media of neighbouring state has started taking interest in the remarkable progress made in various areas of development and public welfare in Madhya Pradesh. In this context, a delegation of journalists from Maharashtra state has arrived in the state. The delegation visited various places in the state, saw the development works, apprised themselves with the innovations and met the farmers and entrepreneurs to get acquainted with the condition of the state. The journalists delegation also met the Public Relations Minister Dr. Narottam Mishra at the latters residence. Welcoming the delegation on their visit to the state Dr. Mishra said that the state has made remarkable progress through the implementation of schemes related to agriculture, education, employment, industry and women and child development related directly to the common man in the state. Dr. Mishra said that the state has witnessed a historic achievement of rise in irrigation area from 7 lakh hectare to 40 lakh hectare in the last 14 years in state. It is due to the six-time rise in irrigation area that Madhya Pradesh has received the Krishi Karman Award consecutively. Work of providing water for irrigation to every field has been taken up on priority. He said that Chief Minister Shri Chouhan has ensured adequate power supply to every section after implementing power feeder separation system in Madhya Pradesh on the lines of Gujarat. Dr. Mishra said that several schemes of Madhya Pradesh are now being implemented in other states also. These include Ladli Lakshi Yojana, Cycle Supply Scheme. Mukhya Mantri Teerth Darshan Yojana. The PR Minister said that the recently launched Bhavantar Bhugtan Yojana is proving useful for farmers who are now receiving a respectable price for their produce in the market. Dr. Mishra gave information about the activities of parliamentary affairs and public relations in the state. They were given specific information about the provisions and schemes for being awarded under different categories and to give accreditation, insurance scheme, Shraddhanidhi yojana for journalists. The journalists told Dr. Mishra that they were very happy to witness the natural beauty of Madhya Pradesh specially Bhopal. They have acquired new information during their visit to various institutions. The journalists delegation from Maharashtra met Commissioner Agriculture Production of Madhya Pradesh Shri P.C Meena and Principal Secretary Farmers Welfare and Agriculture Development Dr. Rajesh Rajoura on October 29. They collected information about schemes implemented in the field of agriculture for farmers by the state government and achievements of the state. The Journalists were told by Commissioner Agriculture Production Shri P.C. Meena that the effective work plan for doubling income of farmers in Madhya Pradesh is being complied with. The state has been receiving the Rashtriya Krishi Karman Award for the last five years consecutively. Principal Secretary Dr. Rajora has informed that Madhya Pradesh tops in the country in production of pulses, oil seeds, grams, masoor, soybean, guava, tomatoes and garlic. Similarly, Madhya Pradesh holds second rank in the country in production of wheat, arhar, sarson, amla, oranges, peas and coriander. The agriculture production of Madhya Pardesh was 2.14 crore metric tonne in the year 2004-05, which has grown to 5.44 crore metric tonne in the year 2016-17. He further added that the state government has given priority to implement the recommendations of Dr. Swaminathan Commission to redress the grievances of the farmers beside development of the agriculture sector. 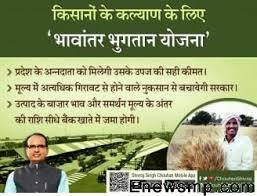 The Krishi Cabinet has been formed in Madhya Pradesh in the interest of the farmers. Moreover, Dr. Rajora informed that the Bhavantar Bhugtan Yojana is being implemented in the state first time in the country for the crops of soybean, groundnuts, sesame, ramtil, maize, moong, urad and arhar. Registartion of the farmers have been made on the portal under the scheme. Over 16 lakh farmers of the state have registered themselves for different crops in this scheme. He further informed that free registration was carried out from September 11 to October 15. Crops have started arriving in the krishi upaj mandis of the state. The difference between minimum support price and the model sale price is being deposited in the bank accounts of the farmers. Delegation of Journalists also visited Tribal Museum of Culture Department, State Museum of Archeology Department and Shaurya Smarak. On this occasion, it was informed that Madhya Pradesh is located at the center point of the country geographically. The borders of Madhya Pradesh touch borders of 5 states. Glimpses of these states are clearly visible in the tribal culture of the state. Different phases of the life of tribal culture , festivals, and ceremonies like marriage etc. are displayed in the museum in the interesting and attractive manner. Museum has been established with an objective to watch tribal community in totality and to understand their life. Delegation of Journalists from Maharashtra also visited State Museum of Archeology Department. Person in-charge of the State Museum informed that the Museum houses 16 galleries. The State Museum has been constructed at the cost of Rs. 12 crore. Pre-historic fossils, excavated material, metal idols, records, idols, royal collection, textile, freedom struggle, postal stamps, autographs, manuscripts, pictures, currencies and arms etc. are being exhibited nicely in the galleries of the museum. Minister of State for Cooperative Shri Vishwas Sarang said that Seed Federation is preparing to introduce its brand like IFFCO and KRIBHCO. Execution is being made by forming short term and long term schemes by Seed Federation. Minister of State Shri Sarang was addressing the annual general meeting of State Cooperative Seed Federation. Shri Sarang said that Seed Federation will have its brand. Quality of seeds will be maintained. Marketing of seeds will be done through seed producer committees through this brand. He said that execution on this plan has already started. This is a long term plan. The Minister of State said that logistic facility has been given to committees as part of short term scheme to ensure sale of seeds of seed producer committees. Shri Sarang said that seed federation will implement suggestions of seed producer committees. Marketing chain of seed societies will be made through the federation. The Minister of State for cooperative Shri Sarang said that the areas will be earmarked which are suitable for seed production and seeds producer committees are producing the seed there. Cluster involving one or more district will be formed. The committees will be given technical and scientific inputs for seed production. Supply of this seeds in the areas where it is in demand will be ensured. Annual report, budget and income and expenditure of the federation was approved in the meeting. Managing director of seed federation Shri RK Ghiya, MD, Apex Bank, Shri Pradip Nikhra, MD, Seed Certification Board, Shri KS Tekam, officers of concerned departments and office-bearers of seed producer committees were present in the meeting. 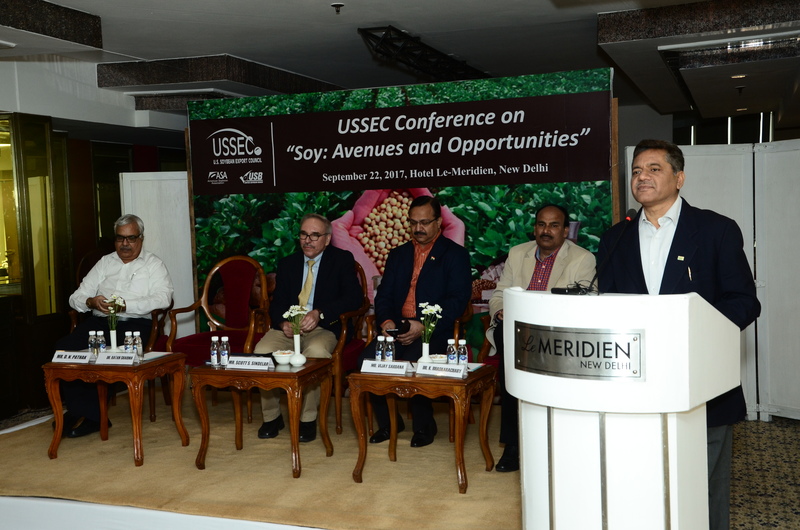 A conference on the Soy: Avenues and Opportunities was organised by the US Soybean Export Council (USSEC) by involving its various stakeholders from the industry, government, academia, agri policy experts, US department of Agriculture (USDA and National Institute of Nutrition etc at Hotel Le Meridien, New Delhi. the Minister Counselor of Agriculture Affairs at the American Embassy, New Delhi Said" If India wants to increase production of soyabean to meet domestic demand, it should allow use of innovative technologies, including genetically modified organism or GMO or allow imports from global market". He said the existing processing capacity can be utilised by importing oilseed and highlighted that India's neighbour like Bangladesh is buying from overseas market. India is fifth largest producer of soyabean in the world with production of around 10-12 million tonnes, while the US at the top with 120 million tonnes output. an agriculture policy and trade expert spoke about addressing the nutritional challenges and creating employment through soy food business. Vijay replied the query on the GST and the regulatory matters. Dr. Prabodh Halde, head regulatory affairs, Marico covered the regulatory norms on the edible oil and other processed food products. Dr. Jyoti Prakash Tamang, Dean Sikkim University talked about various fermented soy food product and its commercialization in India. Mr. D N Pathak, Executive Director of the Soy Processors Association of India (SOPA) stated that soy food is one of the fastest growing businesses in India with an annual growth of 8 to 10%. Mr. Pathak advocated that our government should consider including soy in the school feeding and social welfare programs by framing proper policy on this. Mr. Indranil Chatterjee from the DuPont Nutrition presented about the protein rich foods and beverages made by using soy protein isolates and concentrates. Speaking on the role soy can play in health and nutritional security of India, Dr. Ratan Sharma; head Soy Food Program of the USSEC stated that Soybean is one of the very few plants those provide a high quality protein with minimum saturated fat. Soybean helps people feel better and live longer with an enhanced quality of life. Soybeans contain all the three macronutrients required for good nutrition, as well as fiber, vitamins, minerals. Soybean protein provides all the essential amino acids in the amounts needed for human health. Protein in just 250 grams of soy bean is equivalent to protein in 3 liters of milk or 1 kg of mutton or 24 no�s of eggs. In addition to being a rich source of nutrients, soybean has a number of phytochemicals (isoflavones), which offer health benefits along with soy protein. Soy protein and isoflavones together contribute to a number of health benefits such as, cancer prevention, cholesterol reduction, keeping heart healthy, combating osteoporosis and menopause regulation. Being low in glycaemic index soy plays a very important role in maintaining the low sugar levels in diabetics. Dr. Sharma discussed about various soy products including of the soymilk, tofu, soy nuggets, soy fortified wheat flour and gram flour, soy based Dal Analogue, and suggested that these products have been made by using high end processing technology, tasty and highly safe for consumption. He further emphasised that soy could be a wonderful solution to reduce the protein calorie malnutrition in India, and our government should include soy as a main nutritional ingredient for various supplementary nutrition and welfare programs to ensure a healthy young generation. Dr. Sharma further explained about the nutritional quality of the soy oil from USA. Besides the regular nutritious soy oil US has developed high oleic soy oil. High oleic soy oil is being very popular as industry preferred substitute for partially hydrogenated vegetable oils and are used in all manners of processed foods especially the snack foods for deep frying. High oleic soy oil is free from trans fats as well as lower in saturated fat and contains three times more of beneficial monounsaturated fatty acid compared to conventional soy oil. As per Dr. sharma recently in August 2017 US Food and Drug Administration FDA approved Bunge North Americas petition for a qualified health claim linking soybean oil consumption to reduced risk of heart disease. Soybean oil is the US most commonly used ingredient and top dietary source of polyunsaturated fats. Soy oil is the second largest edible oil used in India. Soybean oil is considered heart-healthy oil as its cholesterol-free and low in saturated fatty acids it contains 61 % poly-unsaturated fatty acids. Two fat components essential for health and wellbeing, linoleic and linolenic acids, are also found in the right proportions in soybean oil. It is also a good source of vitamin E. Like fish oils, soybean oil contains omega-3, known to be protective against heart disease and cancer. Discussing about the Soy food business opportunities in India Dr. Sharma very clearly mentioned that raw material plays a major role to produce a quality product delivering proper nutrients and making a tasty product. Food specialty soybeans are not grown in India limiting the growth of soy food sector in lack of desired quality product with limited value addition possibilities. Dr. Sharma highly recommended the food specialty soybeans from USA which produces an excellent quality soy food with much better acceptability of the end product and excellent value addition possibility when compare with the Indian soybeans. Recently soy food processing has been immersed as a very good source of creating the employment opportunities on a small, medium and large scale. India is the fifth largest producer of soybeans but in lack of awareness on its nutrition and the proper processing technologies this product is not getting the acceptance in the Indian diet. Although the soy food processing sector is growing at a faster rate of 10% annually but still needs to develop with a pace to bridge the protein gap of the country. This program was attended by a large number of people from the soy food industry, trade associations, nutrition professionals, scientists and professionals from the multinational companies from all over the country along with the representatives from the press and media. The U.S. Soybean Export Council (USSEC) is a dynamic partnership of key stakeholders representing U.S. soybean producers, commodity shippers, merchandisers, allied agribusinesses and agricultural organizations. Through a global network of international offices and strong support in the U.S., USSEC provides trade and technical services as well as market access support in order to build a preference for U.S. soy and soybean products. An MoU would soon be singed between Jabalpur University of Madhya Pradsh and Punjab Agriculture University for exchange of agriculture techniques and research. 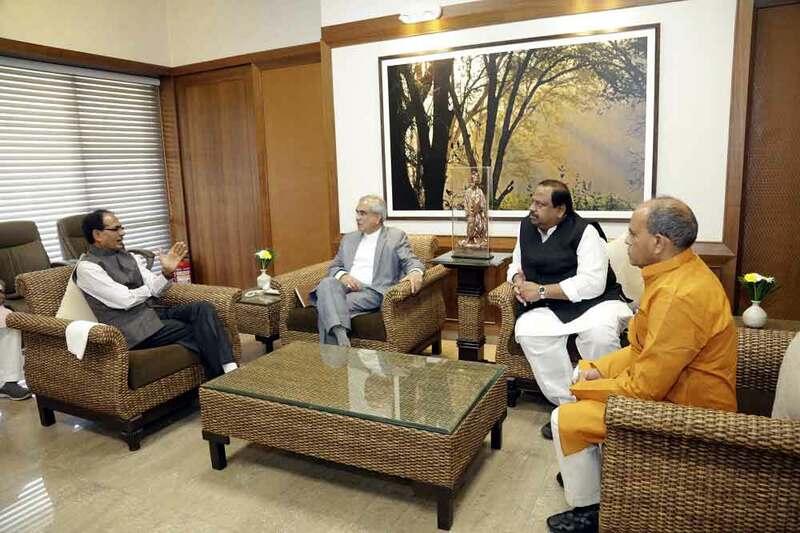 This was decided during discussions between Chief Minister Shri Shivraj Singh Chouhan and his Punjab counterpart Shri Prakash Singh Badal at Ludhiana on Sunday. Punjab's Deputy Chief Minister Shri Sukhbir Singh Badal also paid a courtesy visit to Shri Chouhan. Earlier, the Chief Minister visited Punjab Agriculture University. Shri Chouhan. He witnessed new researches in agriculture, development of varieties of mustard, drip irrigation, new varieties of mushrooms and their product, advanced agriculture implements and treatment of crop diseases. Punjab's ACS Agriculture Shri Suresh Kumar, Agriculture Minister Sardar Tota Singh and university's Pro-Vice Chancellor Shri B.S. Dhillon were also present on the occasion. The Chief Minister also witnessed an exhibition on the premises of the university. The university also gave presentations before Shri Chouhan. The Chief Minister lauded activities of the university. Mr. Ranjan Mukherjee Additional Director General, Prasar Bharti, is inaugurating the media workshop on �communicating Science & Biosafety� Makhanlal Chaturvedi National University, in Bhopal today. Prof. B.K. 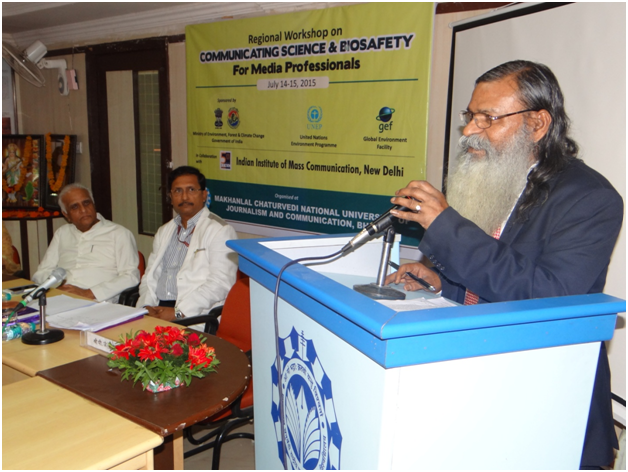 khutiala, Vice Chancellor, Makhanlal Chaturvedi National University, is inaugurating the media workshop on �communicating Science & Biosafety� Makhanlal Chaturvedi National University, in Bhopal today. Prof. B.K. khutiala, Vice Chancellor, Makhanlal Chaturvedi National University, Mr. Ranjan Mukherjee Additional Director General, Prasar Bharti, and Dr. P.J. 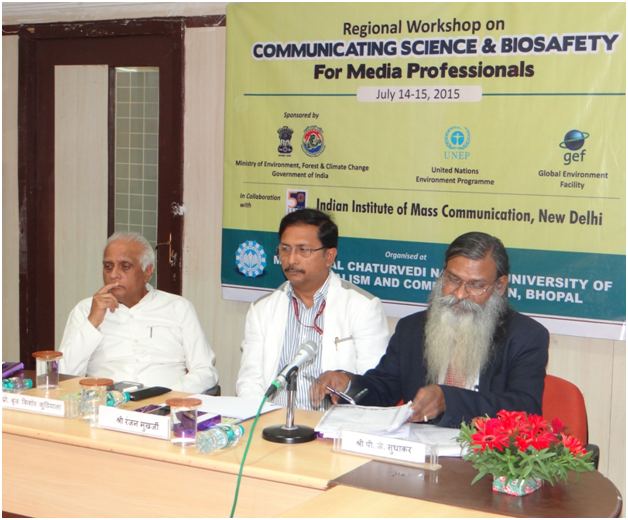 Sudhakar, ADG, PIB Bhopal are at the media workshop on �communicating Science & Biosafety� Makhanlal Chaturvedi National University, in Bhopal today. The Green Revolution, India is a big success story in agriculture sector. The scientific innovations and research should be over-all welfare of society. Radio is a mass media which popularize the hybrid varieties of rice which was known as �Radio Rice�. Bio safety also includes saving the man from the mankind. Media should search for the truth and it should have a truthful reporting and objectivity. Speaking on the occasion, Dr. P.J. Sudhakar, Addl. Director General of PIB, Bhopal said that the government has taken several measures on bio safety which includes setting up of Institutional Bio Safety Committee on Recombinant DNA (IBSE), Review Committee on Genetic manipulation and Genetic Engineering Appraisal Committee. The Bio safety regulatory system is governed by rules under the Environment Protection Act, 1986. Mr. Ranjan Mukherjee Additional Director General, Prasar Bharti, is addressing the media workshop on �communicating Science & Biosafety� Makhanlal Chaturvedi National University, in Bhopal today. The biological warfare should not happen for the betterment of the society and world. The Cartagena Protocol for bio-safety of United Nations framed important guidelines for the biosecurity and biosafety. Indian parliament passed several legislations like Plant Varieties and Farmer�s Rights Act, Geographical Indications Goods Act and Bio-Diversity Act for fulfilling the obligations of UN Convention on bio-diversity. Prof. Geeta Bamezai of IIMC explained the objectives of the workshop. Dr. P.J. 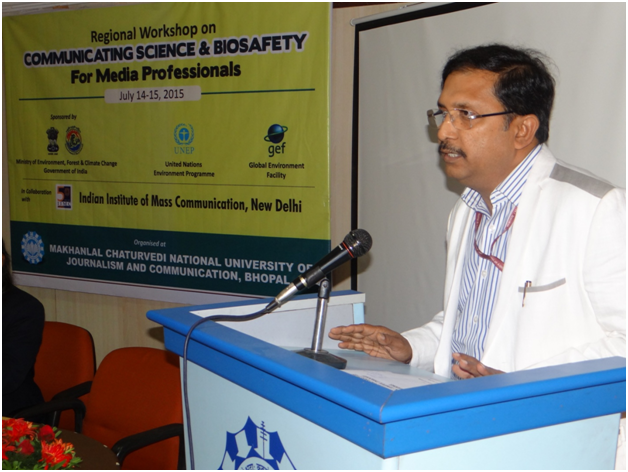 Sudhakar, ADG, PIB Bhopal is addressing the media workshop on �communicating Science & Biosafety� Makhanlal Chaturvedi National University, in Bhopal today. Union Agriculture Minister Shri Radha Mohan Singh while inaugurating National Conference on The Department of Agriculture & Cooperation has approved the Price Stabilisation Fund (PSF) as a Central Sector Scheme, with a corpus of Rs.500 crores, to support market interventions forprice control of perishable agri-horticultural commodities. PSF will be used to advance interest free loan to State Governments and Central agencies to support their working capital and other expenses on procurement and distribution interventions for such commodities. For this purpose, the States will set up a revolving fund to which Centre and State will contribute equally (50:50). The ratio of Centre-State contribution to the State level corpus in respect of North East States will however be 75:25. The revolving fund is being mooted so that requirements for all future interventions can be decided and met with at the State level itself. Central Agencies will, however, set up their revolving fund entirely with the advance from the Centre. Procurement of these commodities will be undertaken directly from farmers or farmers� organizations at farm gate/mandi and made available at a more reasonable price to the consumers. Initially the fund is proposed to be used for onion and potato only. Losses incurred, if any, in the operations will be shared between the Centre and the States. Detailed guidelines for the scheme have now been approved and are available on the departmental website www.agricoop.nic.in . Union Agriculture Minister Shri Radha Mohan Singh while inaugurating National Conference on Development and Export of Spices in Pusa campus, New Delhi today, said that concerted efforts are needed to produce clean spices at competitive prices in order to sustain India�s share in world market speaking on the occasion he said that. Spices farmers have been facing the problem of low productivity, fluctuating prices coupled with biotic and abiotic stress resulting in low farm income. However, efforts of diversification, unfolding of nutraceutical and health benefit of spices and farming system models have provided better opportunity for improving income from spices, he added. Shri Singh said that ICAR-Indian Institute of Spices Research Calicut and National Research Centre on Seed Spices Ajmer have pioneered in developing a number of high yielding varieties and production technologies. Shri Radha Mohan Singh said that Spices Board under the Ministry of Commerce & Industry has been spearheading activities for excellence of Indian spices with respect to quality and hygiene of high level. The Board functions as an important link between the Indian exporters and the importers abroad and supports Indian spices brand building amongst the importing countries which is really needed to realize the slogan of Brand India and Make in India, he added. Referring to India�s status in World Spice Trade, Shri Singh said that the export earnings showed a spectacular growth during the period from 2005-06 to 2013-14 as the earning increased from 592.9 million US $ to 2267.67 million US $. The volume of spices exported increased from 350,363 metric tons in 2005-06 to 817,250 metric tons in 2013-14. Shri Singh said that Spices have been playing an important role in the Indian agrarian economy as it accounts for 5% of the agriculture GDP of the country. The agro-climatic conditions in the country provide an ideal habitat for the natural growth of various spices. There is a long list of 75 spices grown in India but chillies, black pepper, ginger, turmeric, cardamom, cloves, nutmeg, coriander, saffron and cumin are commercially more important. Shri Singh said that today, India is the largest producer, consumer and exporter of spices in the world. Acquisition for the CentralGovernment Projects into the purview of the Land Acquisition Act, thus benefiting a largenumber of farmers whose land is acquired for such projects. Chairing a high-level meeting involving the Ministries of Agriculture, Water Resources, RuralDevelopment, the Prime Minister called for a multi-pronged approach to the ultimate goal ofproviding irrigation for every farm through the Pradhan Mantri Krishi Sinchai Yojana. The Prime Minister noted that NREGA had been used over the past few years for creation andaugmentation of irrigation assets. He said that NREGA should be integrated with the overallplan of Pradhan Mantri Krishi Sinchai Yojana. He also called for precise monitoring ofoutcomes in this regard. At the macro-level, the Prime Minister asked the Ministry of Water Resources to identify river-interlinking projects that could be immediately taken up. The Prime Minister called for comprehensive mapping and identification of water bodiesacross the country. He said satellite imagery and 3D photography could be used to guidevillages to best possible sources of irrigation. The Prime Minister has asked concerned departments to look into the possibility of identifyingprogressive farmers, who could take the lead in implementing water conservation andinnovative irrigation techniques. The Prime Minister has also called for integrating water recycling projects of key towns andcities, to irrigation in nearby rural areas. He emphasized the importance of generatingconsciousness among people towards water conservation. The Union Minister for Water Resources, Ms. Uma Bharati, and the Union Minister forAgriculture, Shri Radha Mohan Singh, were present on the occasion. * Agriculture continues to be the backbone of Indian economy. * Agriculture sector employs 54.6% of the total workforce. * As per the 4th Advance Estimates of Production of food grains for 2013-14, total food grain production is estimated to be 264.77 Million Tonnes. Extension & Technology (NMAET); five Central Sector Schemes viz. National Crop Insurance Programme (NCIP), Intergrated Scheme on Agri-Census & Statistics (ISAC&S), Integrated Scheme of Agriculture Marketing (ISAM), Integrated Scheme of Agriculture Cooperation (ISAC) and Secretariat Economic Service; and one State Plan Scheme viz. Rashtriya Krishi Vikas Yojana. Recognizing the importance of Agriculture Sector, the Government during the budget 2014-15 took a number of steps for sustainable development of Agriculture. These steps include enhanced institutional credit to farmers; promotion of scientific warehousing infrastructure including cold storages and cold chains in the country for increasing shelf life of agricultural produce; Improved access to irrigation through Pradhan Mantri Krishi Sichayee Yojana; provision of Price Stabilisation Fund to mitigate price volatality in agricultural produce; Mission mode scheme for Soil Health Card; Setting up of Agri-tech Infrastructure fund for making farming competitive and profitable; provide institutional finance to joint farming groups of �Bhoomi Heen Kisan� through NABARD; development of indigenous cattle breeds and promoting inland fisheries and other non-farm activities to supplement the income of farmers. India ranks first among the world�s milk producing Nations are such 1998 and milk production peaked at 137.97 million tonnes in 2013-14. India has the largest bovine population in the world. The bovine genetic resource of India is represented by 37 well recognized indigenous Breeds of cattle and 13 breeds of buffaloes. Indigenous bovines are robust and resilient and are particularly suited to the climate and environment of their respective breeding tracts. Rashtriya Gokul Mission a project under the National Program for Bovine Breeding and Dairy Development is being launched with the objective of conserving and developing indigenous Breeds in a focused and scientific manner. The potential to enhance the productivity of the indigenous breeds through professional farm management and superior nutrition, as well as gradation of indigenous bovine germplasm will be done with an outlay of Rs. 550 crores. * An allocation of Rs. 50 crore for development of indigenous cattle breed has been provided. * Target for providing institutional agricultural credit to farmers during 2014-15 has been enhanced to Rs. 8 lakh crore which is expected to surpass. * Agriculture credit at a concessional rate of 7% with an interest subvention of 3% for timely repayment will continue during 2014-15. * An allocation of Rs. 5,000 crore for 2014-15 has been made for scientific warehousing infrastructure for increasing shelf life of agricultural produce and thereby increasing the earning capacity of farmers. * A higher allocation of Rs. 25,000 crore has been made to the corpus of Rural Infrastructure Development Fund during 2014-15 which helps in creation of infrastructure in agriculture and rural sectors. * An initial corpus of Rs. 4,000 crore is being created to set up long term rural credit fund in NABARD to give a boost to long term investment credit in agriculture. * For ensuring increased and uninterrupted credit flow to farmers and to avoid high cost market borrowings by NABARD an amount of Rs. 50,000 crore during 2014-15 has been made for Short Term Cooperative Rural Credit (STCRC-refinance fund). * To improve access to irrigation, Pradhan Mantri Krishi Sichayee Yojana has been initiated with a sum of Rs. 1,000 crore in the year 2014-15. * To mitigate price volatility in the agricultural produce a sum of Rs. 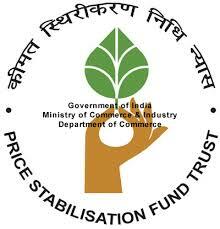 500 crore has been provided for Price Stabilization Fund. * Government has initiated a scheme for Soil Health Card for every farmer in a mission mode with an initial allocation of Rs. 100 crore in 2014-15. * An additional amount of Rs. 56 crore has been made to set up 100 mobile soil testing laboratories countrywide. * National Adaptation Fund for climate change has been established with an initial allocation of Rs. 100 crore. * To protect landless farmers from money lenders 5 lakh joint farming groups of Bhoomiheen Kisan will be financed through NABARD in the current financial year. * A Kisan TV - Channel dedicated to agriculture will be launched with the initial allocation of Rs. 100 crores in the current financial year. * An initial allocation of Rs. 200 crore has been allocated for establishing Agriculture Universities in Andhra Pradesh and Rajasthan and Horticulture Universities in Telangana and Haryana. * An allocation of Rs. 100 crore has been made in the current financial year for setting up of two institutions of excellence in Assam and Jharkhand which will be at par with Indian Agricultural Research Institute, Pusa. * An allocation of Rs.100 crore is made for 2014-15 for setting up Agri-tech Infrastructure Fund with a view to increasing public and private investments in agriculture and making farming competitive and profitable. * Various initiatives taken by Government to support agriculture and allied sectors is to sustain the growth rate at 4%. 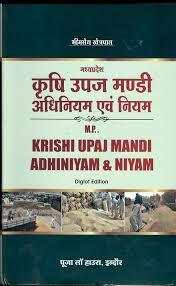 * In order to increase profitability for small and marginal farmers, Rs. 200 crore has been earmarked for setting up of 2000 Farmer Producer Organisations. * Wage employment under MGNREGA will be mainly used for more productive asset creation substantially linked to agriculture & allied activities. * Sum of Rs. 14,389 crore for Pradhan Mantri Gram Sadak Yojana for 2014-15 which will improve access for rural population including farmers. * With a view to promoting farmers and consumers interest setting up of a national market will be accelerated by encouraging States to modify their APMC Act and other market reforms. * With a view to develop commercial organic farming in the North Eastern Region a sum of Rs. 100 crore has been allocated. Central Government recognizes and discharges its responsibility to assist State Governments in overall development of Agriculture sector. Effective policy measures are in position to improve agricultural production and productivity and address problems of farmers. State Governments are also impressed upon to allocate adequate funds for development of agriculture sector in State plan, as well as initiate other measures required for achieving targeted agricultural growth rate and address problem of farmers. The Immediate challenge to the Ministry of Agriculture when the new Government had taken over, was to sustain the increasing agricultural output of the country in the face of impending deficit rainfall in this year 2014-15. All the requisite preparatory measures were made in coordination with the State governments to have the District-wise contingency action plans in place and to bring in flexibility in the various schemes in order that the States are enabled to cope with any desired changes in the Approved Action Plans for tackling the situation arising out of deficit rainfall. With the perspective the Central Research Institute for Dry Land Agriculture (CRIDA) in collaboration with State Agricultural Universities and the State Governments has prepared crop contingency plans in respect of 576 districts across the country. Further, all necessary and appropriate steps have been taken to meet the seed and fertilizer requirement and to disseminate information and on suitable farming practices to be followed in such a situation. I take pleasure in informing that the Tamil Nadu Technology Development & Promotion Center of CII is organizing the third edition of AgriCon 2014: Conference on Farm Mechanization & Post Harvest Technologies on 19th December 2014 at Hotel Hilton, Chennai. In the context of increasing commercialization of agriculture, farm mechanization has been helpful to bring about a significant improvement in agricultural productivity. The factors that justify the strengthening of farm mechanization in the country can be numerous. The present trend in agricultural mechanization is for high capacity machines through custom hiring and for contractual field operations. The pace of farm mechanization in the country accelerated with the manufacture of agricultural equipment by the local industries. However, mechanization of horticulture, plantation crops and commercial agriculture is yet to be introduced in the country. In future this calls for developing appropriate technologies for mechanization. The conference attempts to support this growth and understand the trends in farm mechanization and post harvest management. The conference aims to focus on key growth parameters like technology innovation, new products, new markets, next-generation technology, & implications for allied industries. Around 200 senior management personnel representing Industry leaders & senior executives of leading manufacturers of agriculture machinery companies, ICT Companies, agro based companies, agricultural universities, central universities and labs, fresh produce exporters; progressive farmers; retail chains and government agencies are expected to attend this conference. I am writing you to invite you to participate and also nominate senior colleagues from your organization to attend this important conference. Please confirm your participation / nominations by completing the enclosed registration form and sending it to us by fax/email at the earliest. For more details about conference registration and sponsorship please contact Mr. Hariharan TP @ Mob. 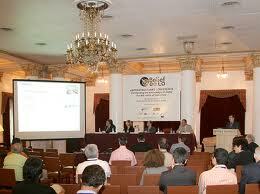 09788790347 / hariharan.tp@cii.in I look forward to your participation. Bhopal, 5th Dec�14: Soil is linked to everything around us and performs many important roles in sustaining life on Earth. All soils support biomass production, whether it is natural vegetation or planted for agriculture and forestry. From the smallest seedling to the largest tree, all land-based vegetation depends on soil to provide them with nutrients, water and root support. In turn, this vegetation supports animal life on land. Soil and water quality are very closely linked and, to a significant extent, soil properties determine water quality. As water passes through soil it is filtered and purified which helps to generate clean and wholesome groundwater. Soil organic matter is an extremely important component of soil. It improves nearly all soil properties (e.g. moisture retention, soil structure, drainage, nutrient storage) and therefore plays a vital role in many functions of soil. Afforestation programmes will help to avoid soil erosion. Contour bunding is one the methods for effective soil conservation. World Soil Day is celebrated on 5th December across the year every year. Soil biodiversity refers both to the relationship of soil to biodiversity and to aspects of the soil that can be managed in relation to biodiversity. Soil biodiversity relates to some catchment management considerations. Biodiversity and soil are strongly linked, because soil is the medium for a large variety of organisms, and interacts closely with the wider biosphere. Conversely, biological activity is a primary factor in the physical and chemical formation of soils. Soil provides a vital habitat, primarily for microbes (including bacteria and fungi), but also for microfauna (such as protozoa and nematodes), mesofauna (such as microarthropods and enchytraeids), and macrofauna (such as earthworms, termites, and millipedes). The primary role of soil biota is to recycle organic matter that is derived from the "above-ground plant-based food web". Soil is in close cooperation with the wider biosphere. The maintenance of fertile soil is "one of the most vital ecological services the living world performs", and the "mineral and organic contents of soil must be replenished constantly as plants consume soil elements and pass them up the food chain". The correlation of soil and biodiversity can be observed spatially. For example, both natural and agricultural vegetation boundaries correspond closely to soil boundaries, even at continental and global scales. Although the earth�s climate has been slowly evolving over millions of years, rapid changes have occurred in recent times due to the activities of humans. Climate change is now recognised as something which is affecting all our lives. Soil is a part of the natural world that is both affected by and contributing to global warming. Soil is the one of the largest sources of carbon in the world. It is primarily accumulated through plants which �fix� the carbon from carbon dioxide in the air; the soil then directly absorbs the carbon as the plants decay. Additionally, dead leaves and animals are broken down by microbes in the soil and carbon is accumulated. The change in temperature and rainfall patterns is also damaging the physical structure of soils. The organic matter in particular is being affected, its balance being crucial to the nutrient balance of the soil, its stability, the amount of water it can hold, and the populations of soil organisms. Additionally, the changes are likely to leave some soils more vulnerable to damage by erosion. Soil quality is a measure of the condition of soil relative to the requirements of one or more biotic species and or to any human need or purpose. According to the United States Department of Agriculture Natural Resources Conservation Service, "Soil quality is the capacity of a specific kind of soil to function, within natural or managed ecosystem boundaries, to sustain plant and animal productivity, maintain or enhance water and air quality, and support human health and habitation." The European Commission's Joint Research Centre defined that "Soil quality is an account of the soil's ability to provide ecosystem and social services through its capacities to perform its functions under changing conditions." Soil quality reflects how well a soil performs the functions of maintaining biodiversity and productivity, partitioning water and solute flow, filtering and buffering, nutrient cycling, and providing support for plants and other structures. Soil management has a major impact on soil quality. Soil quality is at risk from a number of threats driven by a range of man-made and natural pressures including climate change, land use change and land management practices. Human activities have changed the character and quality of our soils over time. We have destroyed protective vegetation cover and have kept soil bare for long periods of time. We also actively add nutrients and pesticides to soils and cover them with housing and infrastructure. All of these activities can impair, or even destroy, the ability of soil to carry out its essential functions. Climate change is a long-term change of weather patterns including temperature, wind and rainfall. Global warming is enhanced by human activities that increase atmospheric concentrations of greenhouse gases that trap the sun�s heat and warm Earth�s surface. Sealing is the permanent covering of soil with hard surfaces such as roads and buildings. The impacts that the sealing of soils can have are- loss of all soil functions; loss of high quality agricultural land; loss of natural habitat; increased flood risk by making run-off more rapid and peak discharge greater; habitat fragmentation. Compaction is the process by which soil particles are forced closer together reducing soil porosity. This is caused by heavy machinery traffic and, to a lesser extent, by animals trampling on wet soils. Soil erosion is the washing or blowing away (by wind or water) of the top layer of soil (dirt). This is a serious problem for people who want to grow crops. Crops are the foods that farmers grow. If the soil has eroded, the crops will not grow very well. Soil erosion was a big problem in the Midwestern United States in the 1930s dust bowl. Erosion also leaves large holes in the earth, which can weaken buildings and even cause them to collapse. Soil erosion can be conserved in several ways. Planting wind breaks can be effective. A wind break is a line of plants that are planted to stop or slow the wind. A thick row of bushes planted next to a field of plants can stop the wind from blowing the soil away. This method also helps against water erosion, as the soil gets caught up against the roots of the bushes, rather than washing away. Terrace farming can also be effective. Terraces are level places that have been made by people on hill sides. People can cut level sides into the side of hills to create a place to grow crops. If the crops are growing on a slope, then one should plant them in lines that run across, the slope, rather than up and down. So, if the slope goes downhill to the south, then the plants should be in rows that run from east to west. To prevent decomposition the government can put up groynes (wooden planks) along the beaches, or they could build sea walls against the cliffs. 5% in Australia is caused by rainfall. Contour bunding is a proven sustainable land management practice for marginal, sloping, and hilly land where the soil productivity is very low. Farmers use a multi-step process to promote the formation of rough terraces along contour lines on sloping land. First the vegetation on the shifting cultivation plot (mostly fodder and forage trees and bushes) is cut down and the leaves and small twigs removed from the branches by slashing. All the material is left on the surface to dry. The leaves and twigs gradually decompose. After a few weeks, the remaining dry material is rolled into bundles and arranged along contour lines. The material is anchored with pegs, stones, and (where possible) tree stumps. This is the beginning of the contour bund. The farmers then incorporate the remaining leaf litter and decomposed organic matter into the soil between the bunds and plant crops. Over time, as the soil gradually deposits above each bund and is eroded below, rough terraces are formed. The process is labour intensive and farmers need to regularly check and maintain the bunds to allow the soil to collect. 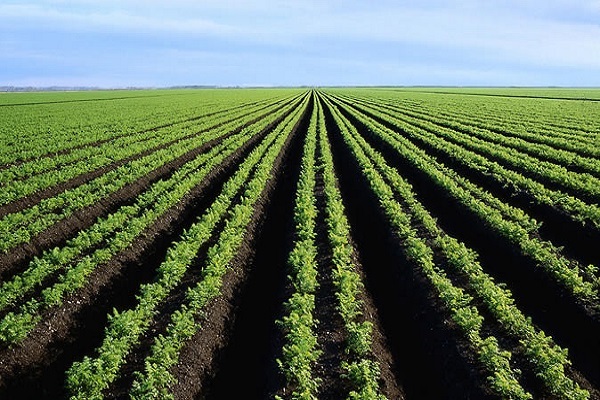 Agriculture and other users of land are challenged to develop strategies for sustainability that conserve non-renewable natural resources such as soil. Much attention has been paid in recent decades to mitigating soil erosion through physical conservation measures and to providing supplementary nutrients and water to meet crop needs. Less consideration has been paid to the soil as a dynamic living resource, although its condition is vital to both the production of food and fibre and to global balance and ecosystem function. The quality and health of soil determine agricultural sustainability, environmental quality and as a consequence of both plant, animal and human health. A healthy soil has the ability to perform or function according to its potential, and to change over time due to human use and management or to natural events. Soil health is enhanced by management and land-use decisions that consider the multiple functions of soil and that take into account that soil is a living organism. Without maintenance of biodiversity, the soil's capacity to recover from natural or anthropogenic perturbations may well be reduced. Similarly, maintenance of the soil's capacity to perform functional processes, such as those associated with nutrient cycling and the breakdown of organic matter, is important in order to sustain plant growth in the long-term. Agriculture has relied on the use of natural fertilizers -- substances that increase the nutrient levels of soil for most of human history. Synthetic fertilizers made an entrance at the end of the 19th century and paved the way for modern agricultural production. Their use increased crop yields and brought on an agricultural revolution, the likes of which the world had not seen before. Synthetic fertilizers continue to have far-reaching effects, both positive and negative, and are likely to remain a part of human life for some time to come. Synthetic fertilizers have long-term negative effects. Synthetic fertilizers kill beneficial microorganisms in the soil that convert dead human and plant remains into nutrient-rich organic matter. Nitrogen and phosphate-based synthetic fertilizers leach into groundwater and increase its toxicity, causing water pollution. Fertilizers that leach into streams, rivers, lakes and other bodies of water disrupt aquatic ecosystems. Synthetic fertilizers increase the nitrate levels of soil. Plants produced from such soil, upon consumption, convert to toxic nitrites in the intestines. These harmful nitrites react with the hemoglobin in the blood stream to cause methaeglobinaemia, which damages the vascular and respiratory systems, causing suffocation and even death in extreme cases (when blood methaemoglobin level is 80 percent or more). Synthetic fertilizers damage the natural makeup of soil in the long term. Plants that grow in overly fertilized soil are deficient in iron, zinc, carotene, vitamin C, copper and protein. Integrated Nutrient Management refers to the maintenance of soil fertility and of plant nutrient supply at an optimum level for sustaining the desired productivity through optimization of the benefits from all possible sources of organic, inorganic and biological components in an integrated manner. The main concept of INM is to provide regulated nutrient supply for optimum crop growth and higher productivity, improvement and maintenance of soil fertility and zero adverse impact on agro � ecosystem quality by balanced fertilization of organic manures, inorganic fertilizers and bio- inoculants. Vermicomposting is the process of turning organic debris into worm castings. The worm castings are very important to the fertility of the soil. The castings contain high amounts of nitrogen, potassium, phosphorus, calcium, and magnesium. Castings contain: 5 times the available nitrogen, 7 times the available potash, and 1 � times more calcium than found in good topsoil. Several researchers have demonstrated that earthworm castings have excellent aeration, porosity, structure, drainage, and moisture-holding capacity. The content of the earthworm castings, along with the natural tillage by the worms burrowing action, enhances the permeability of water in the soil. Worm castings can hold close to nine times their weight in water. �Vermiconversion,� or using earthworms to convert waste into soil additives, has been done on a relatively small scale for some time. A recommended rate of vermicompost application is 15-20 percent. Vermicompost is nothing but the excreta of earthworms, which is rich in humus and nutrients. We can rear earthworms artificially in a brick tank or near the stem / trunk of trees (specially horticultural trees). By feeding these earthworms with biomass and watching properly the food (bio-mass) of earthworms, we can produce the required quantities of vermicompost. The Indian institute of Soil Science (ICAR-IISS) was established on 16th April, 1988 at Bhopal with a mandate of �Enhancing Soil Productivity with Minimum Environmental Degradation�. In order to accomplish the mandate of the institute, it has given the priority to soil health related issues faced by farmers and other stakeholders. IISS has emerged as a leader in basic and strategic research on soils in the country. It has achieved significant success in the areas of integrated nutrient management, impact on soil under long-term cropping, technology for preparation of enriched composts, soil test based nutrient prescriptions, generation of district-wise GIS based soil fertility maps, organic farming practices, carbon sequestration in soils, sink capacity of soils for heavy metal pollutants, recycling of wastes, soil microbial diversity and biofertilizers, quality standards for municipal solid waste composts etc. The institute has to take up the emerging challenges of increasing food-grain production and ensuring food and nutritional security from shrinking land resources, characterizing and conserving large soil-biodiversity for appropriate deployment in agriculture, achieving self reliance in crop fertilization through indigenous mineral and by-product sources, developing efficient technologies for waste recycling, maintaining soil quality and ecological balance, and developing energy efficient agriculture and sequestering carbon by reorienting it's research pursuits addressing the emerging issues viz., enhancing nutrient and water use efficiency; sustaining soil and produce quality; soil biodiversity and genomics, climate change and carbon sequestration; minimizing soil pollution etc. * World Soil Day is celebrated on 5th December across the year every year. CM of MadhyaPradesh Reviews Agriculture development and Farmer welfare department.